Nascar is free Official Nascar App for Windows 8, and gives all the latest news and information from the world of NASCAR. 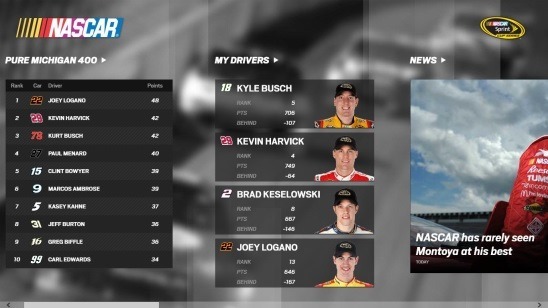 This Nascar app gives the users the ability to follow their favorite drivers, see the Live Nascar Sprint Cup Series leader boards for the year 2013. You can access various latest News, Videos, 2013 Sprint Cup driver standings, Driver’s information and his track record of current season. Plus, you can also see the race schedules and prepare yourself in advance, so that no kind of disturbance comes while you watch your favorite driver race, or if the race is going to be held in your town, then you can buy the tickets in right time. This app requires internet to run continuously at the background and shows quick status and notifications at the Lock Screen. This free Nascar App for Windows 8 is present under the Sports Category in Windows Store. Like I said before, Nascar App for Windows 8 is a official app for NASCAR. The app has got a nice looking interface with cars images on the background. There are lots of images used in the app to make it look appealing. The driver’s car number is shown as the way it looks in real life, that is with the same number, color, and font. This makes recognizing a driver easy. Navigating between screens is easy as you won’t go too deep between different screens. This Nascar app doesn’t asks for any type of registration for using the app, so you can access the app with ease. 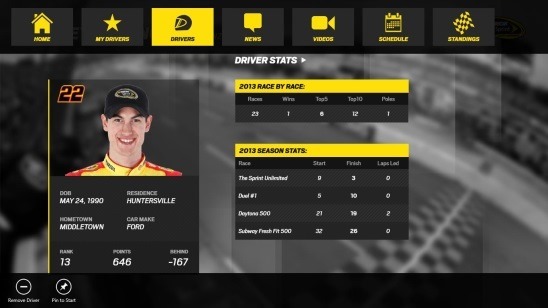 The moment you launch the app, you’ll be in the Main Screen of this Nascar App, which consists of the standings/results of the most recent race, latest News, Race Videos, Race Schedules to keep up with current year Sprint Cup Series, and Current Year Standings on the basis of four categories which are: Top 10, Top 5, most Points scored, most race wins. Simply click on the requisite category to view it’s contents. All the information provided by the app is latest. You’ll get the news in textual article format, and reading articles is not that hard. Likewise the video collection is also good. You can watch the highlights videos, video of the final lap, race rewinds, press conferences. 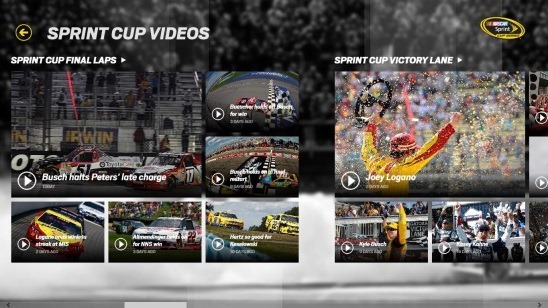 The things that I really liked in this NASCAR app for Windows 8 are: the app has some quality videos which are shot by the different cameras on the driver’s car, this gives you the almost actual feeling, which the driver gets during the race, and the contents from Hall Of Fame, which has the interviews of the legends of NASCAR. The app makes navigating between screens easy by providing a flyout at the top of screen, which you can see by right clicking on any screen within the app. This flyout contains the shortcuts to Home Screen, Drivers, News, Videos, Schedule, Standings, and My drivers. My drivers is the category where you can see the information of your favorite previously added drivers and their track record of current season. Good version of the NASCAR app. 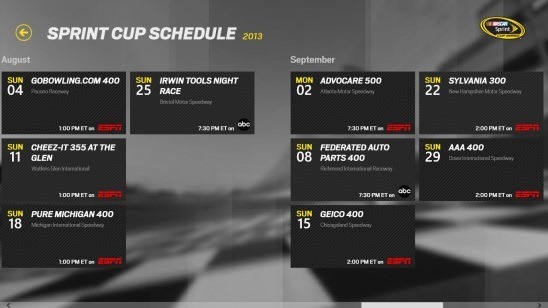 Minute-to-minute information related to NASCAR Sprint Cup Series. View the upcoming race schedules. Pin screens to Start Screen. This Nascar App is a well-made sports app. The app gets updated on regular basis and gives latest information. The videos get played in the full screen and show the latest actions of the race, but there’s a need to improve the video quality as they lack a little behind in terms of quality, and the app also needs to include the Search feature. Other than that, it is a great app. Certainly a good free app.